His Swollen-arm Hunkiness almost prevented me from noticing the excellent vampiric mantis and the hideously deformed space armadillo in the background. Almost. Oiled muscled hunk. Tight leather. Peculiar looking probe. It’s beautifully painted. The artist really knows his stuff and his use of color and atmospherics is impressive. The alien critters and broccoli trees are plausible. Can I blame this on the art director? 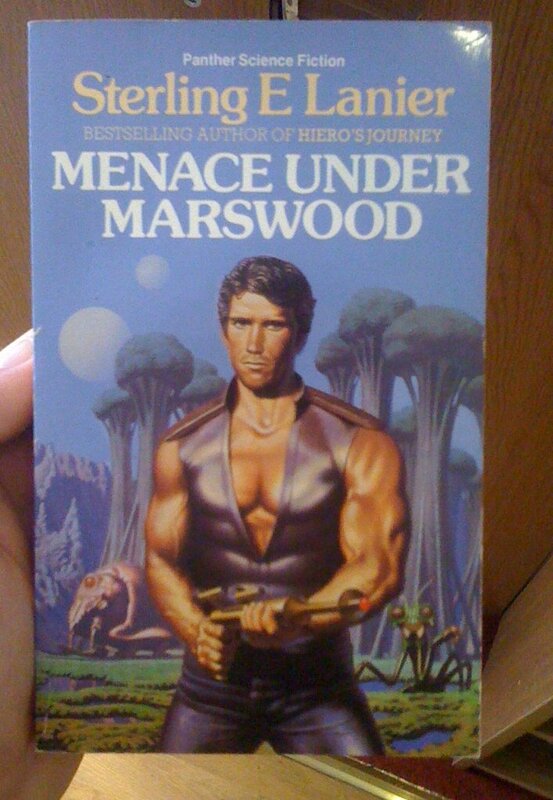 Because for a closeup of an oily, tanned scowly dude with arms like bags of bowling balls and vacuum-sealed leather clothes and USS Enterprise-shaped gun and alien marsh and trees and monsters behind him, this is about as good as it gets. @Alessandra: good call, I think you’re 90% correct. But take a look at those eyes. They’re wider-open than they could be, and the brows aren’t furrowed enough. The eyes are more hurt puppy-dog than furious concentration. I rather like the praying mantis in the background! Today’s comments are excellent! All I can say is thanks for a jolly good laugh! Rambo on Monster Island with Thing/Mothra and Kamacuras. Yeah I think he’s pointing that gun in the wrong direction. Why is this not tagged “cleavage”? Behind you! Praying mantis and giant broccoli! Is this what we would get if Dylan Thomas wrote SF? @Phil: that would be Menace Under Milk Wood, the touching Christmas time story of a two-metre-tall goliath, his abusive father and loving yet neurotic mother. Set in scenic Sramreggub, Wales. @Phil, the Dylan Thomas comment made me swoon. You are my hero. @Jane, thankyou ma’am… I think. The really scary part on this cover is the giant broccoli! Regular sized broccoli is scary enough. Also, Sramreggub is buggermars spelled backward… just in case anyone cares. @AR: Wait, is that an Australian or New Zealand accent? I can’t tell. As someone who’s not only seen the films, but had to suffer him as governor — that is NOT an Ah-noldian accent. “Eedehr yoo eet chur BROkhhhhallee…” and it would be “choyz”. What you’ve written there is vaguely Kiwi but the vowels aren’t squished and shifted enough. This guy seems more Stallone-esque anyway. I have never seen a movie with both of them as I feared for my ears and IQ.